When you first start lifting weights you enjoy a seemingly never ending run of gains. Even when your training is suboptimal, you manage to increase strength and muscle mass pretty quickly during those first few months. Unfortunately, those newbie gains don’t last forever. Eventually you have to get smarter with your training. This means trying new training styles and finding what works best for you. But it also means paying close attention to how much work you are actually doing in the gym. As a result, monitoring training volume and intensity is part of the game for serious lifters. This can be accomplished in many different ways which can make it difficult to know which ones are most appropriate. Whether its simple reps and sets or something more involved like bar velocity, finding the style that works best for you is important for long term success. Volume is perhaps the most important variable when it comes to making progress in the gym . Generally speaking, the more volume you accumulate the stronger and bigger your muscles become. Naturally it is important to keep track of your volume to ensure you are doing enough to reach your goals. Often, people will simply calculate the total volume of their training session by multiplying the number of sets, reps, and weight used for each exercise . This is the most basic volume calculation and will suit the needs of most recreational lifters. As you advance in your training career, you may find that simple volume calculations are a bit too simple. When you begin to lift very heavy weights, the volume of that session may actually look small in comparison to the sessions you had as a beginner. Squatting a one rep max (1RM) doesn’t seem like a lot of volume on paper. However, that volume is likely more taxing on your body than a higher rep session with lower weight on the bar . To accommodate this, you need to figure in the intensity when tracking your training volume. A more effective strategy for advanced trainees would be tracking the relative volume of their training. This would involve the multiplication of the number of sets, reps, and % of 1RM that was used for the exercise . A disparity would still exist between the heavier efforts and the higher rep training days. However, this at least takes into account the quality of the volume rather than just the pure quantity. Tracking intensity can be done either through subjective feedback or objective monitoring. For example, Rating of Perceived Exertion (RPE) and Reps in Reserve (RIR) are two of the more popular form of subjective feedback [4, 5]. They both operate similarly in that you are rating how hard you feel an exercise was with a numerical number. RPE is often measured from 1-10 with 10 being absolute maximum intensity. RIR on the other hand is measured by reporting how many repetitions were “left in the tank” after completing an exercise. If you finish a set of 8 reps but feel you could have done 10 reps total, your RIR would be 2 for that set. In the case of RPE, you might report a 7 or 8 for that set. In this way, RIR is a bit more precise in determining the true effort that was given. However, a simple tweak can make the application of RPE more functional. Rather than report RPE for each individual set, you may decide to report a session RPE. That is, you rate how difficult your session was as a whole. This has been shown to be as effective at monitoring training intensity as reporting RPE for each exercise individually [6, 7]. If you are looking for a more objective look into the intensity of an exercise, you might look into measuring bar velocity. 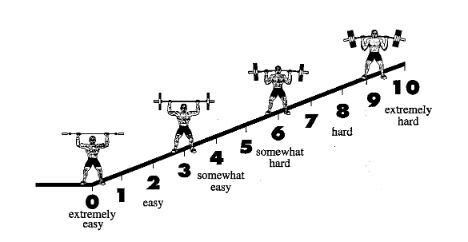 Studies show that bar velocity is directly related to the intensity of the lift [8, 9]. This means that as you lift closer to your 1RM, the velocity of your movement will decrease. Tracking your average bar velocity during a session can tell you how hard you were working and thus the intensity of the session. Velocity based training (VBT) does do well to eliminate the possible reporting error associated with RPE/RIR based training. However, it also requires a velocity tracking device and is a bit more time consuming to set up. So, VBT can only be practically applied to barbell exercises. As a result, VBT may be too cumbersome and impractical for people whose training is not solely based on barbell movements. If you are finding that your training doesn’t pack the same punch as it used to, it may be worth tracking your training volume and intensity. This allows you to see real feedback about how much and how hard you’ve been working in the gym. While it may seem daunting to choose the right method, each measure offers its distinct advantages and disadvantages. As such, there is no wrong answer when it comes to how you choose to track your data. As long as you stay consistent with a given strategy you will likely benefit in the end. Overall, using some of the strategies mentioned above will help you make better training decisions and lead to better training outcomes in the future. Schoenfeld, B. J., Ratamess, N. A., Peterson, M. D., Contreras, B., Sonmez, G. T., & Alvar, B. A. (2014). Effects of different volume-equated resistance training loading strategies on muscular adaptations in well-trained men. Journal of Strength and Conditioning Research / National Strength & Conditioning Association, 28(10), 2909-2918. Haff, G. G. (2010). Quantifying workloads in resistance training: a brief review. Strength and Conditioning Journal, 10, 31-40. Campos, G.E., Luecke, T.J., Wendeln, H.K., Toma, K., Hagerman, F.C., Murray, T.F., Ragg, K.E., Ratamess, N.A., Kraemer, W.J. and Staron, R.S., 2002. Muscular adaptations in response to three different resistance-training regimens: specificity of repetition maximum training zones. European journal of applied physiology, 88(1-2), 50-60. Robertson, R.J., Goss, F.L., Rutkowski, J., Lenz, B., Dixon, C., Timmer, J., Frazee, K., Dube, J. and Andreacci, J., 2003. Concurrent validation of the OMNI perceived exertion scale for resistance exercise. Medicine and Science in Sports and Exercise, 35(2), 333-341. Scott, T. J., Black, C. R., Quinn, J., & Coutts, A. J. (2013). Validity and reliability of the session-RPE method for quantifying training in Australian football: a comparison of the CR10 and CR100 scales. The Journal of Strength & Conditioning Research, 27(1), 270-276. Christen, J., Foster, C., Porcari, J. P., & Mikat, R. P. (2016). Temporal Robustness of the Session RPE. International journal of sports physiology and performance. González-Badillo, J. G., & Sánchez-Medina, L. S. (2010). Movement velocity as a measure of loading intensity in resistance training. Int J Sports Med, 31, 347-352. Jidovtseff, B., Harris, N. K., Crielaard, J. M., & Cronin, J. B. (2011). Using the load-velocity relationship for 1RM prediction. The Journal of Strength & Conditioning Research, 25(1), 267-270.